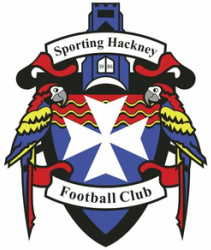 A goal and man-of-the-match performance for Marlon Sharpe and a late Adam Davies strike was enough to ensure Sporting Hackney was the name in the hat for the second round of the Division 3 League Cup on Saturday at the expense of Swansong. An exhausted Player-Manager Jamie Duff commented at full-time, “I heard it’s burgers instead of sandwiches for this week’s post-match grub, but let’s see”. When pressed for a comment on the game he summarised that “We had to make quite a few changes this week. I thought I was unlucky not to score on a couple of occasions in the first half but in the end the lads kept plugging away and I always felt it was just a matter of time before we got the break. We’ll take it and look forward to the next round”. It was a hot afternoon on Hackney Marshes and for the first fifteen minutes the Parrots were forced to play with ten men. Swansong looked dangerous early on with the man advantage and some good possession play, however, it was Hackney who created the first real chance. A deep corner from the left evaded everyone. Sharpe was first to the ball on the right and with the drop of a shoulder beat the left-back and floated a perfect ball into the six-yard area where Jason Daniels’ powerful header came back off the crossbar. In a scrappy first-half, it was the Swansong Goalkeeper who was the busiest of the two having to make several saves, the highlight being a save down low from a Duff Exocet on the half-volley from distance. The Parrots were disappointed going into the break at 0-0 but recognised the final ball had to improve in the second-half. They didn’t have to wait long post-restart for the opener. Sharpe played a one-two on the right and latched onto the ball inside the Swansong box before picking his spot at the far post for 1-0. Hackney enjoyed a period of pressure following the goal but Swansong were working hard to get back into the game. The equaliser came at the midway point from a corner which was headed in at the back post by the Swansong hitman. The game ebbed and flowed in the closing stages with Swansong surviving several goal-mouth scrambles. With a matter of minute to go, the king of the assists, Jeff ‘give me the ball and we will score’ Badu, drilled a low pass across the face of the Swansong goal which was met by debutant Davies at the far post for 2-1 and a place in the second round. It’s now onto the second round of the cup and a mouth-watering tie at home against Old Barkabbeyans Reserves at the Hackney Marshes on the 20th October.